Twenty years is a long time for any band to be active, and few have done it as gracefully as the power pop dudes of Nada Surf. While the New York trio has mellowed out and brightened up since the days when “Popular” was popular, Nada Surf remains undeniably Nada Surf. As a whole, The Stars Are Indifferent To Astronomy makes the statement that the group doesn’t need to constantly reinvent itself, even after two decades together. And that’s really what makes them one of the strongest groups in indie rock. Opening track “Clear Eye Clouded Mind” features Matthew Caws’ wistfully sweet voice, balanced out by the hard-hitting drums of Ira Elliot and the driving bass of Daniel Lorca. On tracks “Jules and Jim,” “Let The Fight Do The Fighting,” and “Waiting For Something,” it’s clear that the band’s lyrics remain their strongest suit. Particularly on “Jules and Jim,” presumably about the subject’s pondering over a drifting romance, their lyrics are always relatable, yet they are never commonplace or lackluster. 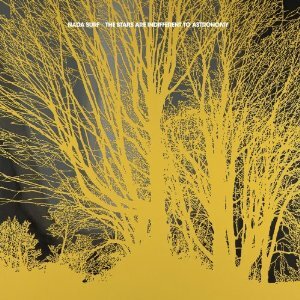 Overall, The Stars Are Indifferent To Astronomy serves as a testament to Nada Surf‘s longevity. With tunes that are continually relatable to high-schoolers and aging Gen-Xers, there is no doubt that Nada Surf will be able to power through another twenty years.